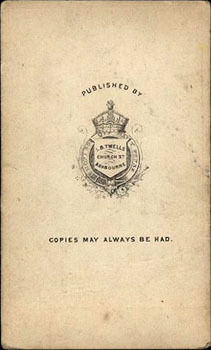 Louis B. Twells probably worked as a photographer in Ashbourne only briefy, during the early 1870s. How can I contribute an image? Louis (or Lewis) Bosworth Twells was born in 1829 at Castle Donington, Leicestershire, son of Thomas Twells and Mary Bosworth (1802-). His father died when he was young, and his mother supported him and his younger sister by working as a boot and shoe maker. The 1851 Census shows him living with his aunt in London, and working as a perfumer, presumably learning the trade. He must have settled in Ashbourne, Derbyshire shortly afterwards, as an 1855 directory shows him there, working as a hairdresser. In early 1857 he married Theresa Snelson (1829-1903), daughter of a schoolmaster from Ashby-de-la-Zouch - between then and 1877, they had six children. Census records and trade directory entries between 1857 and 1884 various show him as a hair cutter/dresser, perfumer, jeweller, silversmith, watch maker, importer of general fancy goods, sponges, &c., and a proprietor of "large show rooms for glass, china, and earthenware." Louis B. Twells died at Ashborne in 1885. His wife and son Louis B. Twells junior continued with the shop until 1903, when Theresa Twells died. No directory or census entries showing L.B. Twells working as a photographer have been found. 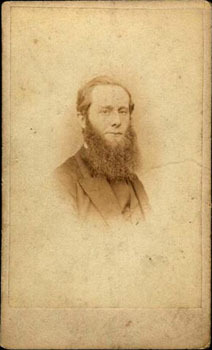 However, a single carte de visite (see below), tentatively dated at c. 1871-1875 is known, suggesting that he did this as a sideline, at least for a brief period. White, F. & Co. (1857) History, Gazetteer and Directory of the County of Derby. Transcribed by Neil Wilson. Anon (1870) Harrod & Co.'s Postal & Commercial Directory of Derbyshire, Leicestershire, Rutland & Staffordshire. - from University of Leicester - Digital Library of Historical Directories. Wright C.N. (1874) Directory of South Derbyshire, Third Edition, October 1874, Derby. Adamson, Keith I.P. (1997) Professional Photographers in Derbyshire 1843 - 1914, The PhotoHistorian, No. 118 Supplement, September 1997, ISSN 0957-0209. Courtesy of John Bradley.